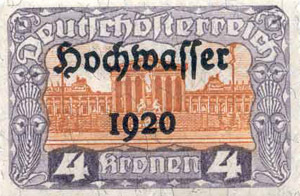 A philatelic journey from the mouth of the River Danube to its source 2840 km (1,870 miles) away in the Black Forest formed the subject of a meeting in Manchester some years ago. At one time all the countries traversed (apart from Germany) had postal links with Austria either through shipping companies (the Austrian Lloyd or the Danube Steam Navigation Company - D.D.S.G.) or through Consular Offices. A brief survey of some of the material shown follows. In addition to services provided by the D.D.S.G., another shipping company, T.B. Morton & Co. of Constantinople, founded in 1855, once carried mail from that city to Rumania's Danube ports and the Black Sea. 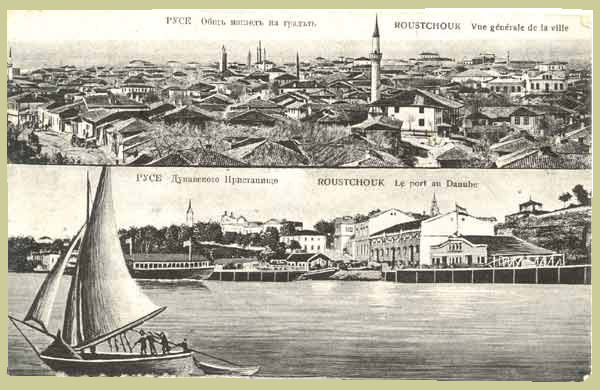 A service was provided from Constantinople via Burgas, Varna, and Constanza to Sulina, Tulcea, Galatz and Braila: see the accompanying maps, on which note that most towns have their 21st century names. 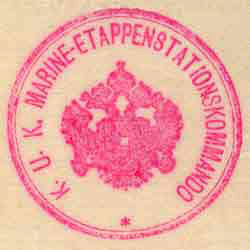 In 1869 the company began to issue crude handstamps on coloured paper, the colour indicating the mail's destination. For Galatz and Tulcea, magenta paper was used; blue-green for Braila. The ½ piastre was stamped in blue ink, the 1 piastre in red. 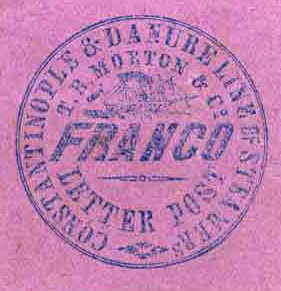 There was a second issue in July 1869 incorporating the outline of a ship above the word FRANCO. 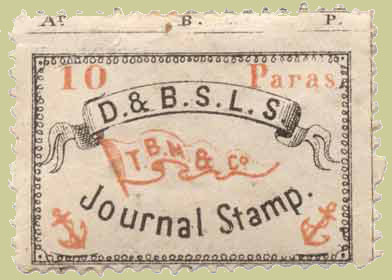 In the next two years, rectangular perforated lithographed stamps appeared in sheets of 50 with values of ½, 1 and 2 piastre for use on letter mail, bearing the initials D. & B.S.L.S. (Danube and Black Sea Line of Steamers) as well as a reference to T.B. 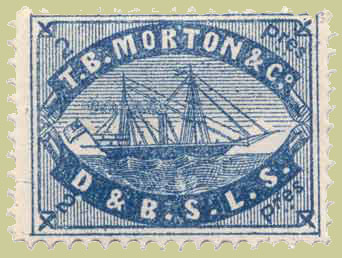 Morton & Co.
For journals, a special stamp was issued in 1872, in sheets of 72, with a value of 10 paras (ie ¼ piastre: 40 paras = 1 piastre according to S.G.). To avoid the lengthy journey through the Danube delta where navigational and political problems were inclined to arise, the DDSG organised an overland route between the Rumanian port of Czernavoda (now Cernavoda) and Constanza (now Kustendje) on the Black Sea. In 1860, a British-owned railway link was built along the route. Special stamps were issued by the railway for mail it carried. The originals were lithographed in blue-green, and inscribed D.B.S.R. (Danube and Black Sea Railway). Later, reprints were made on various coloured papers (the illustrated specimen is on pale lilac). 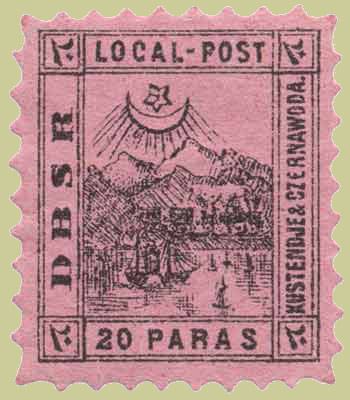 Also within this region, mail carried on Rumanian vessels between about 1890 and 1914 would receive a pictorial cancellation in the form of a steamer showing the date and service involved. Further up river, the much smaller Serbian Shipping Company (S.B.D.) 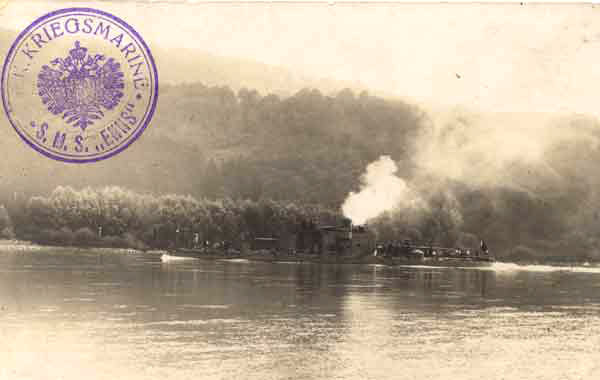 carried local mail between Serbian ports on the Danube and Sava rivers. Forgeries and reprints abound, and genuinely used material is hard to find. On 29th July 1914, the First World War began with the firing of a salvo from monitors of the Austrian Danube Flotilla directed at Belgrade. For the remainder of the war, vessels of the flotilla remained active patrolling the river, clearing mines and other obstructions and supporting the army commanders in military operations. Items of mail from these ships generally received F.P.O. 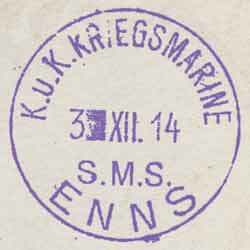 cancellations although a few ships (eg the Enns, a twin-turret monitor, shown below) had their own dated postmarks. Mail from shore bases usually received the local town cancellation. This Feldpost card was sent from S.M.S. Inn, another twin-turret monitor, to Bohemia, on 15 April 1915 when she was based at Petrovaradin. 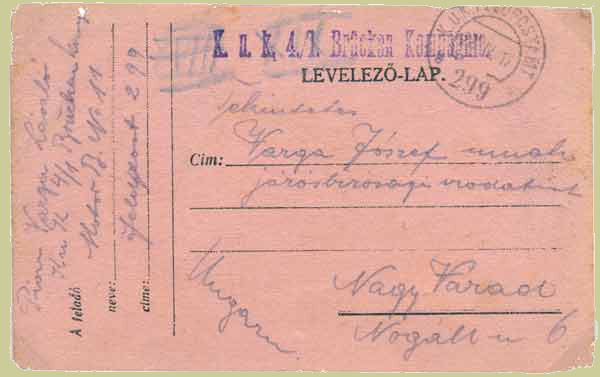 The 2-line Hungarian endorsement indicates free postage for the armed services. In February 1917 Braila fell, giving the Central Powers control of the Danube. 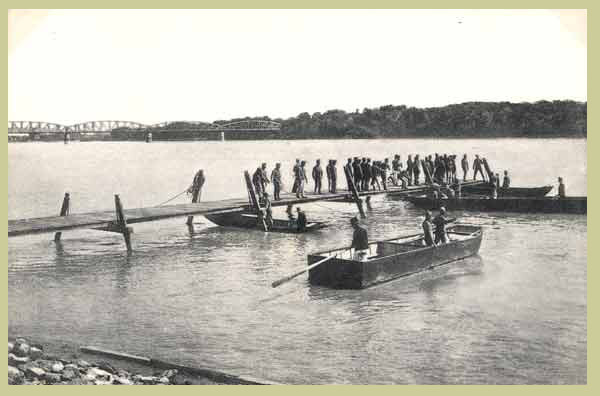 The picture is of a pontoon bridge-building exercise on the Danube. 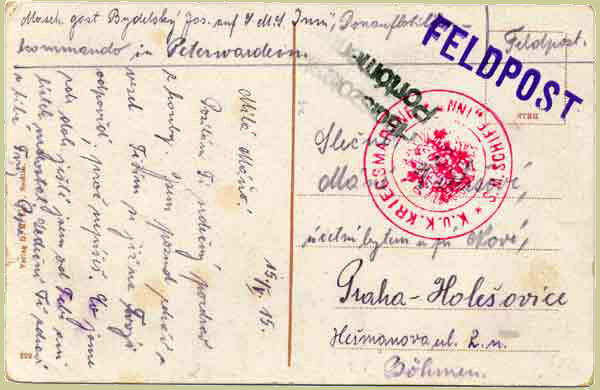 This field post card was sent by a member of 4/1 Bridge Company on 28 April 1917; FPO299 operated in Rumania between August 1916 and November 1918. In WWII, river units formed part of Germany's armed forces and material from them is quite scarce. More recent events in Yugoslavia have given rise to items illustrating the contestants' changing fortunes as towns changed hands during the Bosnian campaign, followed by the 1999 NATO intervention in Kosovo. This postage paid mark was applied by UNTAES, the United Nations Transitional Administration in Eastern Slavonia, which functioned from 10 May 1996 to 15 January 1998. 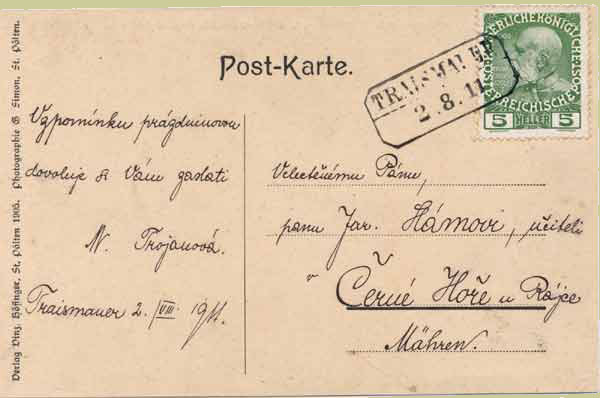 The cover was sent from Sotin to Slunj, ie from a Serb-held area to Croatia, and in order to avoid the use of Serb-inspired postage stamps (which were unacceptable) was sent via UNTAES. In the autumn of 1991, Vukovar was virtually destroyed by Yugoslav National Forces and Cetniks as they advanced into eastern Croatia. 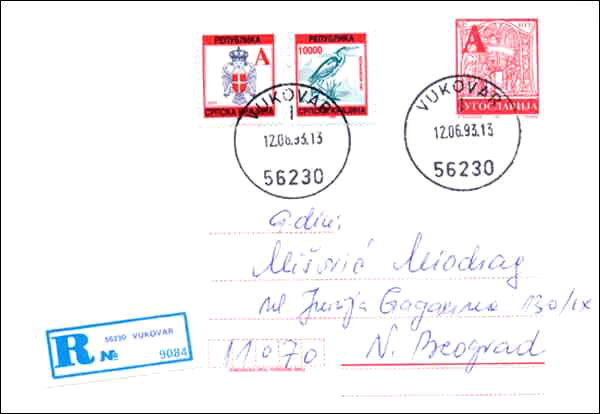 This registered letter of 12 June 1993 is prestamped Yugoslav stationery issued in 1993, with added adhesives of the Serb Republic of Krajina. 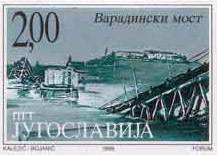 Yugoslavia subsequently issued a set of six stamps (in 1999) depicting bridges which had been bombed during the NATO campaign, the two at Novi Sad (formerly Peterwardein or Petrovaradin) resulting in the closure of the Danube as an international waterway. 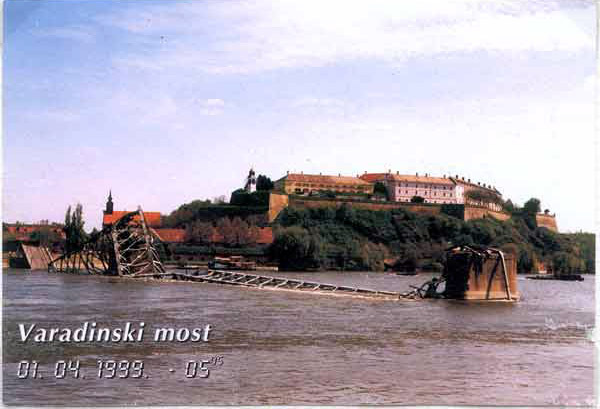 For many years, severe flooding by the Danube gave rise to increasing loss of life and heavy damage to property adjacent to the river as industrialisation developed. 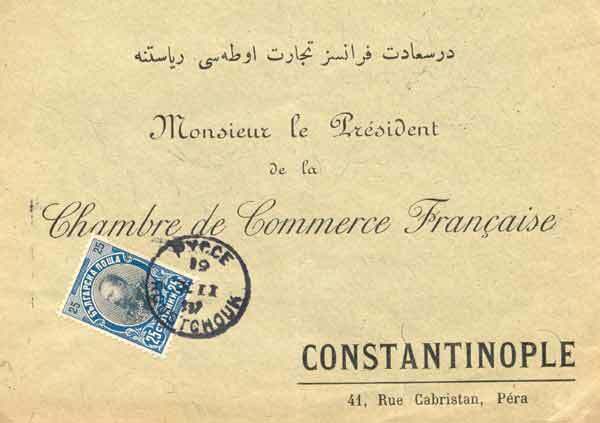 To meet the cost of counter-measures, funds were raised through the issue of bonds, usually in the form of an attractively designed document. Between 1870 and 1877, 32 million florins (or gulden; equivalent to £3M sterling in 1870s money - perhaps £500M today?) was raised in that way. 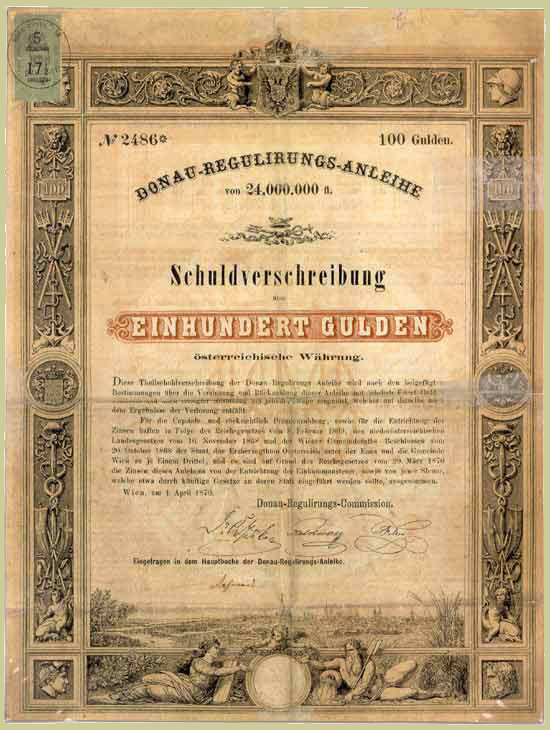 The illustration is of a Loan Note for 100 Gulden, with at the top left a revenue stamp for "5 GROSCHEN ODER 17½ KREUZER" cancelled at Breslau, then in Germany and now in Poland. 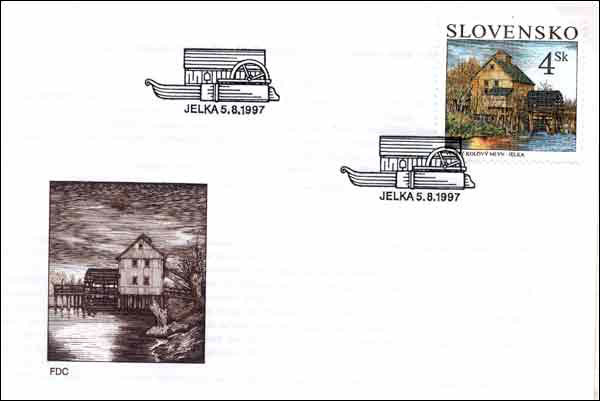 Six countries have issued special stamps to raise funds for Danube flood relief. 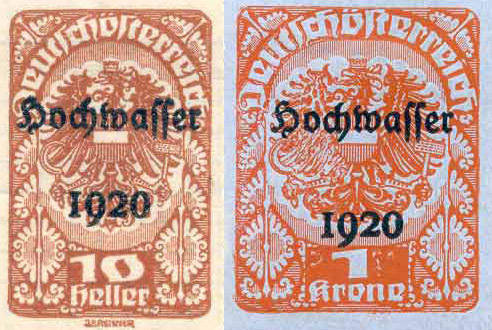 Hungary led the way in 1913 with a set of 17 stamps (1900 definitives, with a special label attached), Austria in 1921 (20 definitives in new colours, with overprints), Yugoslavia in 1926 (12 definitives, surcharged) and Bulgaria in 1939 (4 definitives, surcharged). 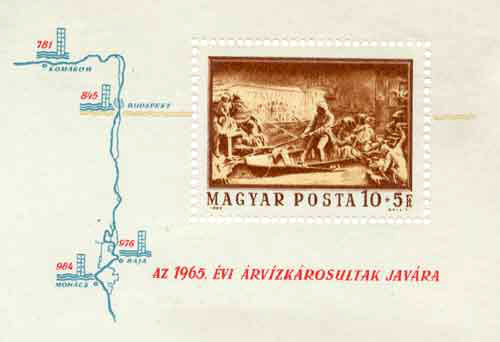 Thereafter specially designed stamps were issued by Hungary (1940, 1965, 1997), Czechoslovakia (1965) and Rumania (1970). There is a bronze relief on the outside of the Franciscan Church in the Inner City of Budapest, showing Miklos Wesselenyi rescuing people from the floods of 13 March 1838; it featured on one of a pair of Hungarian stamps issued in 1965 to raise funds for flood relief. 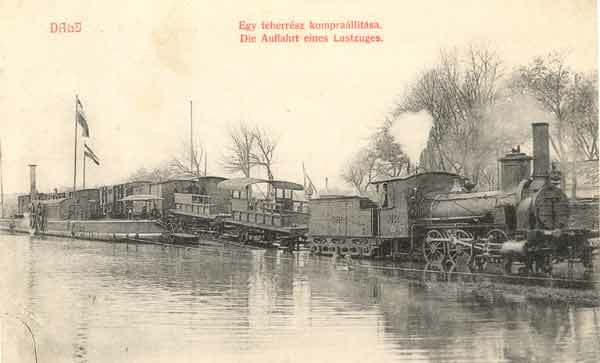 Pictures of the transportation of an entire train across the Danube by steam ferry and of passengers crossing the river by chain ferry remind us that something has been lost in the search for speedier transport and the construction of bridges. 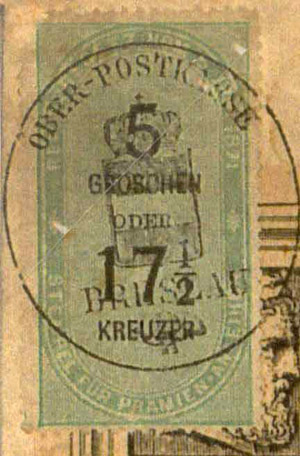 The postcard was sent from Traismauer, a small village on the Traisen (a tributary of the Danube) 60km west of Vienna. 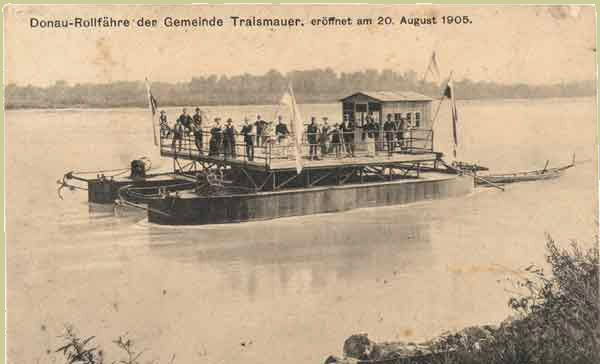 A chain ferry across the Danube was opened on 29 August 1905. The Danube's strong currents were once used to drive machinery installed on water mills moored in the river. By the 1880s their number had become such a hazard to shipping that their presence was banned. One such mill at Jelka was transferred to the river bank and rebuilt, where it operated until 1951. It became a cultural monument in 1983 and appeared on a 1997 Slovakian stamp. The completion in 1971 by Yugoslavia and Rumania of the Djerdap Dam, a mammoth barrage across the Danube, resulted in the submerging of many historically important sites. The original town of Orsova is now submerged; it was once the last station on the railway from Hungary to Rumania, and a busy port where the Danube steamers moored overnight before venturing upstream into the treacherous Kazan defile. A new town, bearing the same name, has been built 5km lower down the river at the mouth of the River Czerna, but many of the historical features of the original have gone for ever. However, several items dating back to Roman times were re-sited at higher levels before the waters rose. 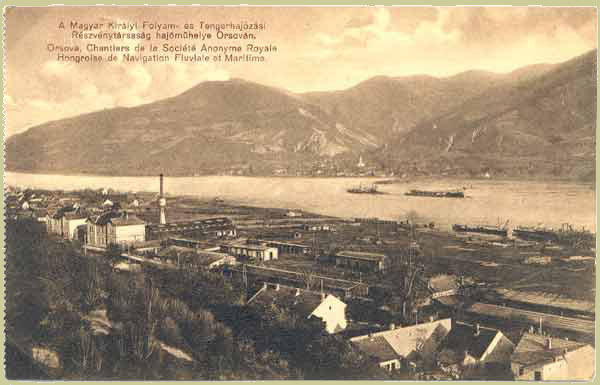 The card shows the port facilities of the Hungarian M.F.T.R. steamship company. During WWI, units of the Danube Flotilla including the Base Ship 'Hebe' were based here; her cachet is illustrated. This card shows the new town of Orsova. 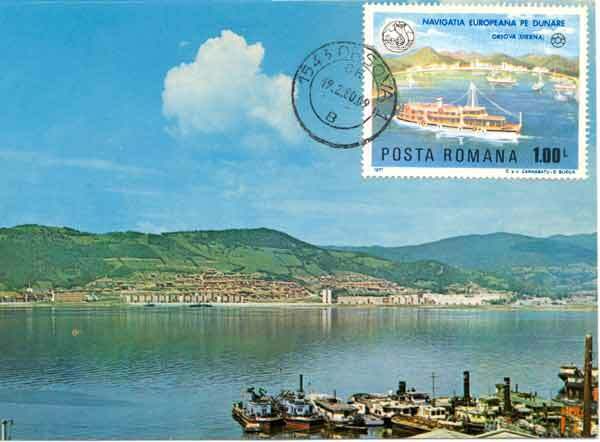 The Rumanian stamp celebrates the Danube as a European navigational resource. 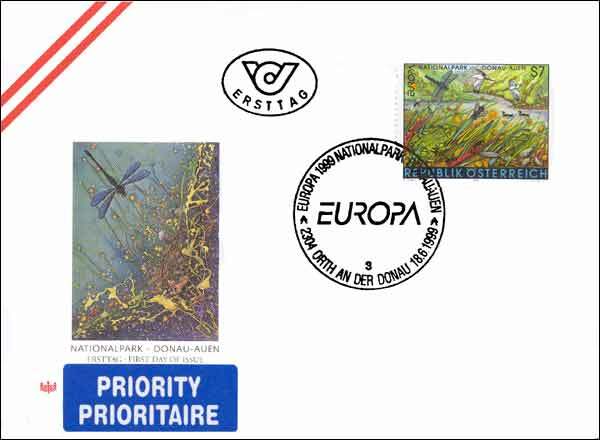 This stamp was issued to commemorate the setting up of the Danube Meadows Nature Park alongside the river just to the east of Vienna. Following a public outcry at a proposal to build a hydroelectric power station at Hainburg, a project was created to protect wildlife on the river between Vienna and the border with Slovakia. Orth an der Donau, where the stamp was cancelled, stands at the mid-point of the National Park; it dates back to the Neolithic and became a parish in the 12th century. The foregoing material provides only a glimpse of the wide range of Danube-related subjects that are available. 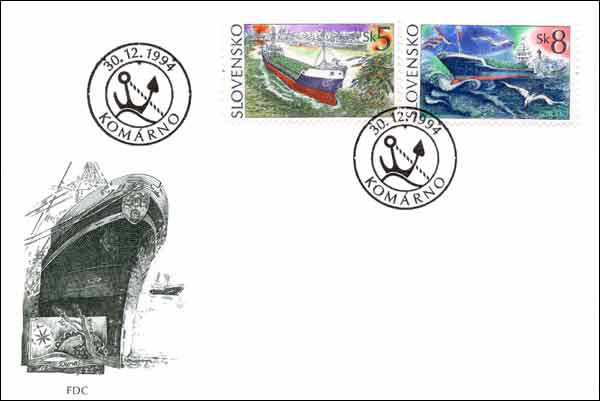 In philatelic terms, the spread is from pre-stamp covers with Danubian cancellations to recent issues depicting, for example, shipbuilding at Komarno, 1768 km from the sea. It is of interest to note that in the pioneering days of the nineteenth century there was a strong British contribution to developments along the Danube. In Austria the first steamship company on the river and the giant wheel in Vienna's Prater park were British backed, as was the first permanent bridge over the river at Budapest and its adjacent tunnel, the first railway in Bulgaria (which linked Rousse [ie Roustchouk or Pyce] on the Danube with the Black Sea port of Varna) as well as the Danube and Black Sea railway, mentioned earlier. Research has shown that by the late 1800s some 70 per cent of ships entering the Danube were British owned. 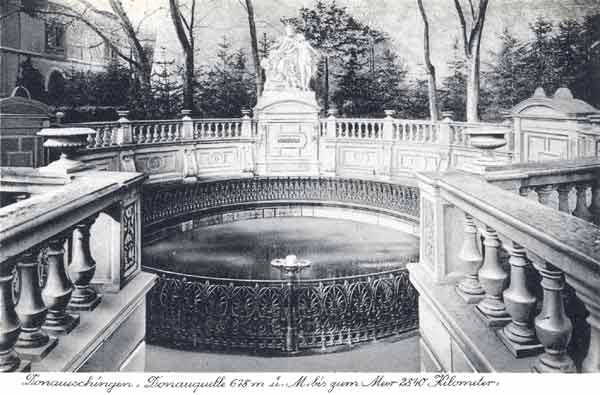 The waters of the River Brigach and those of the Danube Spring (shown above) join those of the River Breg beneath the town of Donaueschingen to form the Danube proper.